Asia and its Islands According to d'Anville; Divided into Empires, Kingdoms, States, Regions, &ca. with the European possessions and settlements in the East Indies and an exact delineation of all the discoveries made in the eastern parts by the English under Captn. Cook. 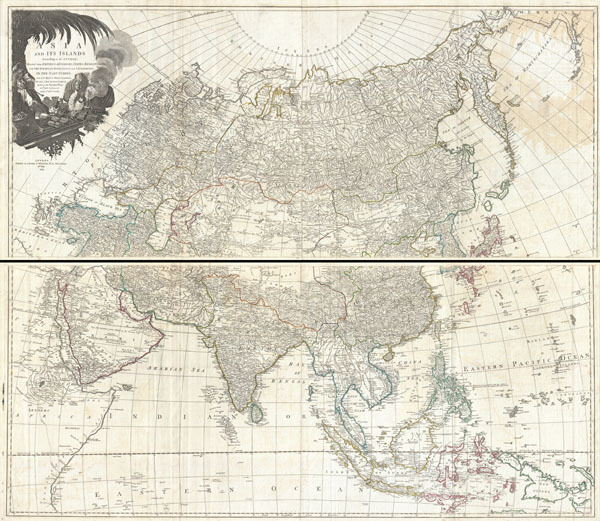 An absolutely stunning and monumental two panel 1794 wall map of Asia by J. B. B. D'Anville. Covers the entire continent of Asia, including Arabia, the Indian subcontinent, and the East Indies. Names countless cities, caravan routes, and geographical features such as islands, undersea shoals, oases, lakes, rivers, and mountains throughout. In Siberia and East Asia the mappings of Cook, Bering (including Behring Island, where he died) and Tschirikow are much in evidence. This map is exceptionally interesting for its detailed work in Central Asia - a little known and largely unmapped region at the time. Anville attempts to notate various historical sites throughout. For example in the Gobi desert, Anville identifies, abet speculatively, the site of Karakarian or Karakorum, the ancient capital of the Mongol Empire, 'Hereabout stood the City of Karakarin or Holin, the ancient Seat of the Monguls Empire.' In a similar vein, he also identifies the ruins of various temples and palaces in Tartary. Southeast Asia and the East India Islands are mapped in detail based upon old Dutch maps with only speculative commentary on the interior. Notes the Kingdoms of Pegu (Burma) Siam (Thailand), Tonkin and Chochin (Vietnam) and Camboja (Cambodia). Curiously notes a Desert in the middle of Cambodia where today we know there is actually a lush jungle. Further south, the Straits of Malacca are noted, as are the Straits of Singapore. Singapore Island, though not identified, is recognizable. An elaborate allegorical title cartouche in the upper left quadrant depicts a bearded, possibly Arab, trader with his goods, an incense burner, and a camel beneath a palm tree. This map was printed on four sheets and was joined by the publisher in to two panels - upper and lower. It frames up dramatically either in separate or floated in a single frame. Published by Laurie and Whittle as plate nos. 26-27 in the 1797 edition of Thomas Kitchin's General Atlas. Very good condition. Original folds. Minor offsetting. Blank on verso. Original platemark visible. Wide clean margins. Four sheets joined into two panels. Rumsey 0411.028, 0411.029, 0411.030. Phillips (Atlases) 4300-26-27, 699. OCLC 7160203. Shirley, R., Maps in the atlases of the British Library, T.LAU-1c (1799 ed.). National Maritime Museum, 375 (3rd ed. 1801).